Arbosh had driven Carolan into a corner and gotten ready to take him out with a huge blow of his Ox-Herd when he realised to his surprise that he wasn't holding the weapon in his hand. "Are you looking for this?" said Carolan, triumphantly raising the stolen weapon over his head. "You disgusting little thief!" Arbosh spat out and reached into his backpack with an annoyed grunt...and pulled out another Ox-Herd from it! "luckily I always go with two of them these days ," he added with a grim smile. "Let's see which of us is better at wielding it!" Surprise your opponents with completely new decks! 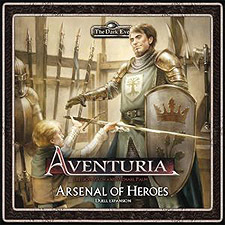 arsenal of Heroes is a duel expansion for Aventuria - the Adventure Card Game, which provides you with enough cards to play all conceivable deck combinations from the basic box.